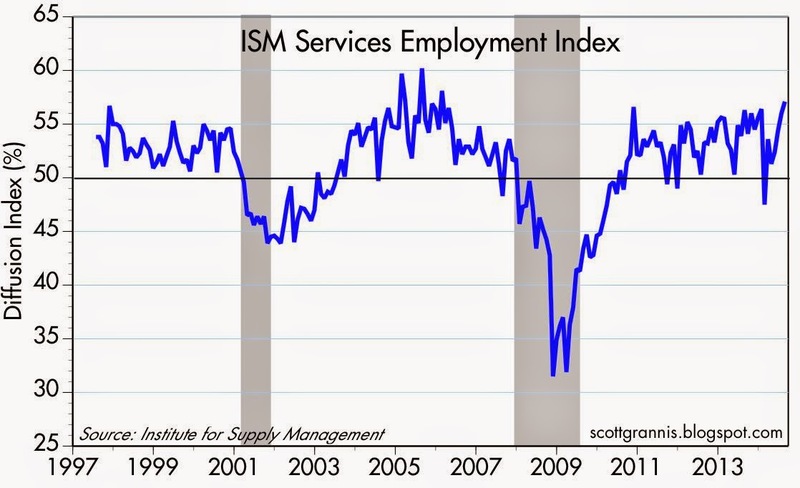 The U.S. economy is firing on all cylinders these days, to judge from the August ISM surveys. On Tuesday we learned of surprising strength in the manufacturing sector. Today came surprising strength in the service sector. 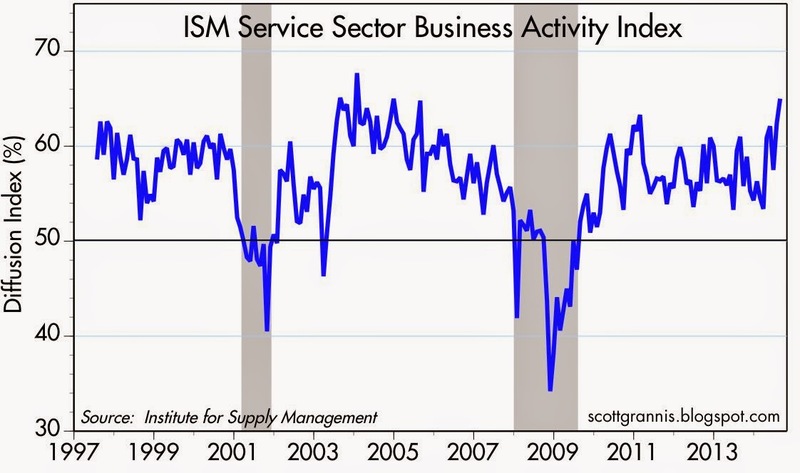 As the graph above shows, the ISM survey uncovered the strongest level of business activity in the service sector in nine years. The employment index, an indication of hiring plans and a good proxy for business' confidence in the future, reached an eight year high. 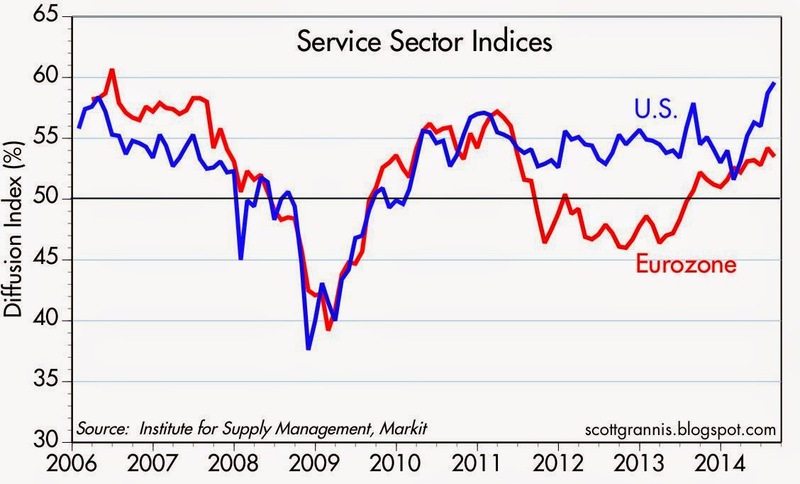 The overall service sector index reached a nine year high, and was by far the strongest recorded in the current expansion. Compared to the lackluster service in the Eurozone economy, the U.S. is practically booming. Current and future indicators of the general health of the service and manufacturing sectors are all encouraging. But to date we haven't seen any meaningful pickup in hiring activity. Businesses may be feeling better about how things are going, but they haven't yet been willing to step up the pace of what has been to date rather lackluster investment. Today's ADP employment report (see graph above) suggests that tomorrow's payroll employment report is likely to show more of the same: growth in private sector jobs of slightly more than 200K per month, or thereabouts. 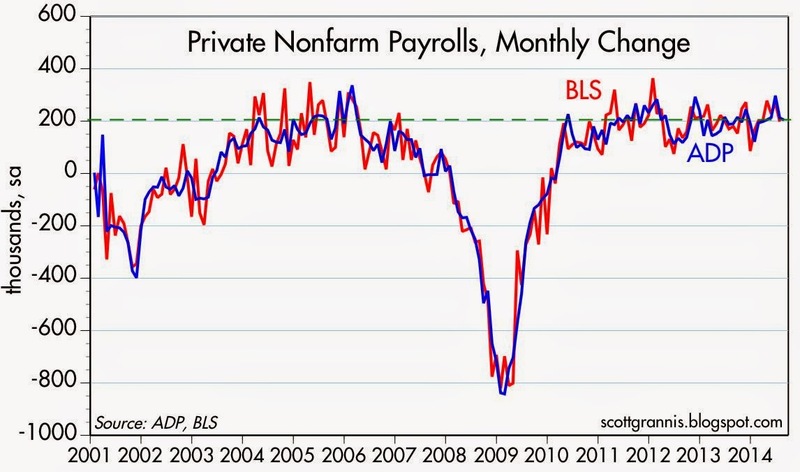 Jobs growth of 300-400K a month is what we'd really like to see, but 200K is no reason to be pessimistic. 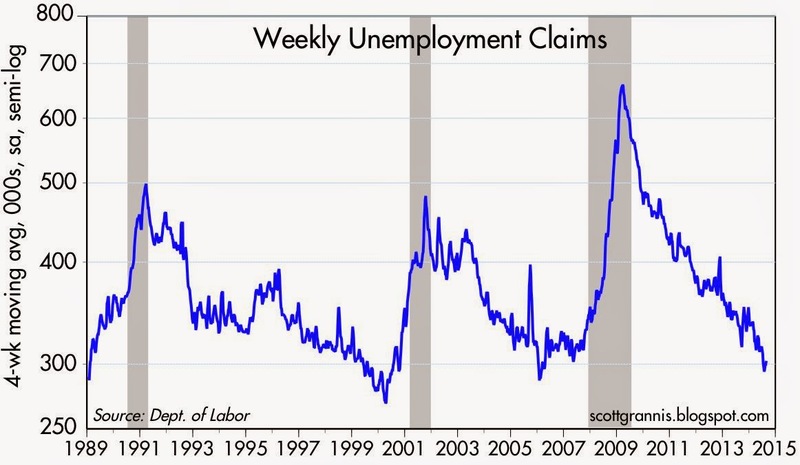 Meanwhile, big corporate layoffs have become almost a thing of the past, and weekly claims for unemployment are about as low as they have ever been. Businesses may not have stepped up their hiring activity, but it's been years since they resorted to any significant layoffs. I think this suggests that the economy is on pretty solid ground these days. Nobody is overextended, everyone has tightened their belts, and profits are rolling in by the bushel. If there is a surprise around the corner, it's more likely to be on the upside than on the downside—more growth, rather than less. Yet the myth of deflationary threats to growth persists. Just today the WSJ sent me the following alert: "The European Central Bank unexpectedly lowered all its interest rates to fresh record lows ... in an effort to keep ultralow inflation rates from undermining the eurozone's fragile recovery." Why should low inflation be a threat to growth? This is one of those myths that has been repeated so often that most people now assume it must be true. Sometimes prices need to fall in order for markets to clear; sometimes businesses need to fail in order for their assets to be redeployed by someone else. Why should lower interest rates be a stimulus to growth? Just because central banks keep repeating that they do doesn't make it true. Monetary policy is not holding back growth, and lower interest rates won't change that reality. Banks already have trillions of excess reserves: a few more or less is not going to change their willingness to lend, or business' willingness to borrow. It's time for better fiscal policies. Governments need to get out of the way by lowering regulatory burdens and marginal tax rates, and by eliminating subsidies. It is unfortunate that so much of the popular, and even trade media misreport "inflation." No, inflation, per se, does not cause growth (although it can help with deleveraging, and encouraging lending on real estate). The right way to think about it is, "Is demand strong enough that we see mild inflation?" When you have good aggregate demand, in a healthy economy you can expect some minor inflation--bottlenecks emerge, and the price signal fixes those bottlenecks. Also, the way real estate appreciation shows up in official inflation stats is very dicey. Appreciation can be "inflation." And official government measures of inflation may overstate inflation a bit. But, if you have a healthy growth economy it is creating demand in new sectors, and that demand is filled by some price signals. You ain't going to get people to move up to North Dakota, or build new housing there, or open up retail spots etc without some price pressures. If North Dakota were a separate nation, should it "fight inflation"? Why? How? There is another idea, of which I am a not sure, but it has to do with how new money enters the economy. Banks extend credit, and they create a deposit to do so. If you borrow to buy a house, the banks creates $150k and gives it to you, and you buy the house with it. Yes, banks (not only the Fed) create money out of thin air. When banks lend on real estate, they are creating new money. So a healthy real estate market means money creation, and money creation means economic growth, until you full capacity. The utopia of a zero inflation, or deflationary economy is...well, a utopia. I cannot think of a major modern economy that has thrived at zero inflation. You do have some "boutique" economies, such as Luxembourg or Switzerland, but they are not really representative. We do have a thick historical record on Japan, and now Europe, struggling at zero inflation. I do not know why the American Right has become fixated on microscopic rates of inflation. In the Nixon-Reagan days, the GOP was happy with 4-5 percent inflation. Nixon beat up on Arthur Burns to loosen up, and the Reaganauts went after Volcker to loosen--back when inflation was around 5 percent, in both cases. I do not think 2-3 percent inflation is the end of the world. It is probably consistent with robust economic growth. If you good have long-term 3 percent real growth and 3 percent inflation, or 1 long-term percent real growth and 0 percent inflation, which would you choose? Incredibly, what I hear is the latter, from certain circles and the ECB, and the BoJ pre-Abenomics. Inflation has become a moral issue for many. I think that is a mistake. 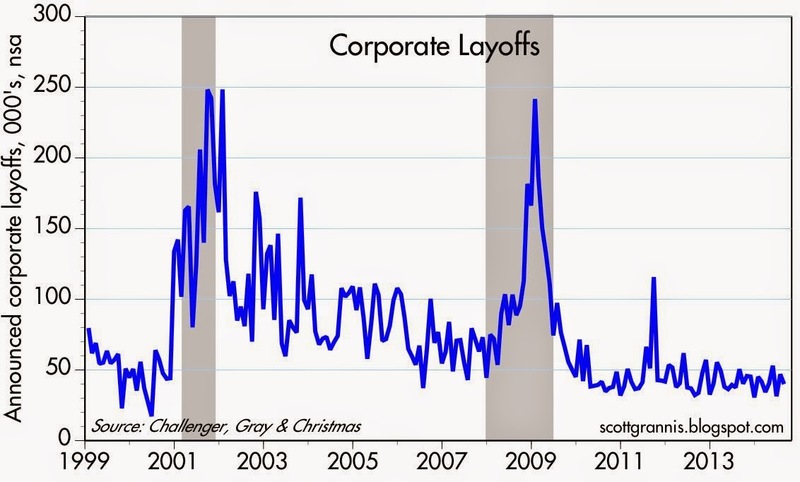 "Meanwhile, big corporate layoffs have become almost a thing of the past"
Usually cannot see any tweaking needed on the blog postings, but had to chime in on this line. Maybe because I am in IT within the insurance industry, but I do see recent big corporate layoffs within the IT industry at least. MSFT 18,000; HP 27,000, IBM 13,000. There still are big corporate job eliminations but might be due to a corporate restructuring due to a changing technology landscape versus an purely economic one. "It's time for better fiscal policies. Governments need to get out of the way by lowering regulatory burdens and marginal tax rates, and by eliminating subsidies." But putting aside hope for just a moment... If we handicap the odds of the above happening, what do we come up with? Seriously, brighter minds have known for a long time how to get an economy closer to potential and yet it doesn't happen, and for all sorts of reasons. The recent past has been ugly with respect to the ideas presented in your quote. Maybe the elections in November bring some relief at the margin. I don't know. But putting blind hope aside, what are the chances we get anything close to the ideas of your quote? Tom L: My graph is consistent with your observation (e.g., corporate layoffs are averaging about 35-40K per month), but my choice of words was, to borrow an adjective from Hillary, "inartful." Thanks for pointing this out. Matthew: The chances of significant fiscal reform are slim right now, but there is a national figure out there who has the right ideas and is introducing them to the public debate in a thoughtful and potentially successful manner: Paul Ryan. And he is not alone in understanding what needs to be done. So there is hope. Scott: I once was very optimistic about Paul Ryan's message. After all, he was a speechwriter for Kemp and we know he's well-versed in supply-side principles. Before he ran with Romney, he was all about a growth message. As recently as 2010 his Roadmap for America's Future featured important things like across-the-board tax rate reductions, the elimination of taxes on cap gains, interest, and dividends, and the elimination of the estate tax and the AMT. There were other features but they all added up to important, fiscal game changing proposals. And he was always on the circuit advocating these growth proposals. But in the last couple years, Ryan's growth message seems to have morphed more into a message of budget austerity. It's been a depressing change to observe. His comments about spending are always well-spoken and there's not much to object about. But it seems to me that he's gone from a sunny, optimistic, growth message to a message of responsible spreadsheet analysis that may result in a balanced budget 20 years hence. More broadly, the Republicans seem to be running on the notion that they're better than Obama. That's fine and it'll likely even work to gain the GOP the Senate majority in November. But noticeably absent from the campaign rhetoric are compelling cases for economic growth based on supply-side principles. The GOP seems scared to emphatically make the case that economic growth will improve all the issues that are ailing the country right now. I now include Ryan in this. Matthew: have you read Ryan's recent op-ed in the WSJ? I see lots of supply-side and pro-growth ideas here. "The way forward I'm proposing fosters risk-taking, ingenuity and creativity. Instead of growing government, it grows the economy and offers everyone greater opportunity and prosperity. It can unwind the cycle of dependency and finally defeat poverty." Also (and I know I'm expanding my argument, but please allow a little leeway), Ryan voted for Medicare Plan D, he voted for TARP, and he voted for the auto industry bailout. I find it very difficult to believe that any champion of supply-side economics would vote in this fashion. But perhaps what's worse is what happened to Ryan after he accepted the VP running mate slot from Romney. Romney's views on defense spending could charitably be categorized as hostile to the idea of smaller government. In any event, in early 2013, Ryan proposed a budget that would spend $2 trillion less (over ten years) than the platform he had run on six months prior. This is pretty good proof that he didn't believe what he was saying in the 2012 campaign (at least with respect to defense spending). It's also pretty good proof that he's willing to shed his supply-side principles just when they matter most.